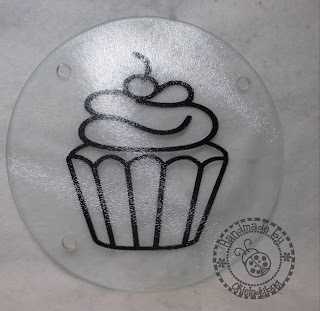 Last month Linda and I made a trip to OKC and I was able to find some glass cutting boards at Dollar Tree. I have been looking for some for quite a while so I felt quite lucky to find as many as I did. My cousin Teresa had been wanting to do some and since she has a Cameo now we finally got together last weekend and get busy. We had to learn to use the Cameo first which since we used Make The Cut it did make it easier. I gave her some lessons on MTC and after she got home her teenage daughter learned to use it as well and I think they might be out of vinyl by now. 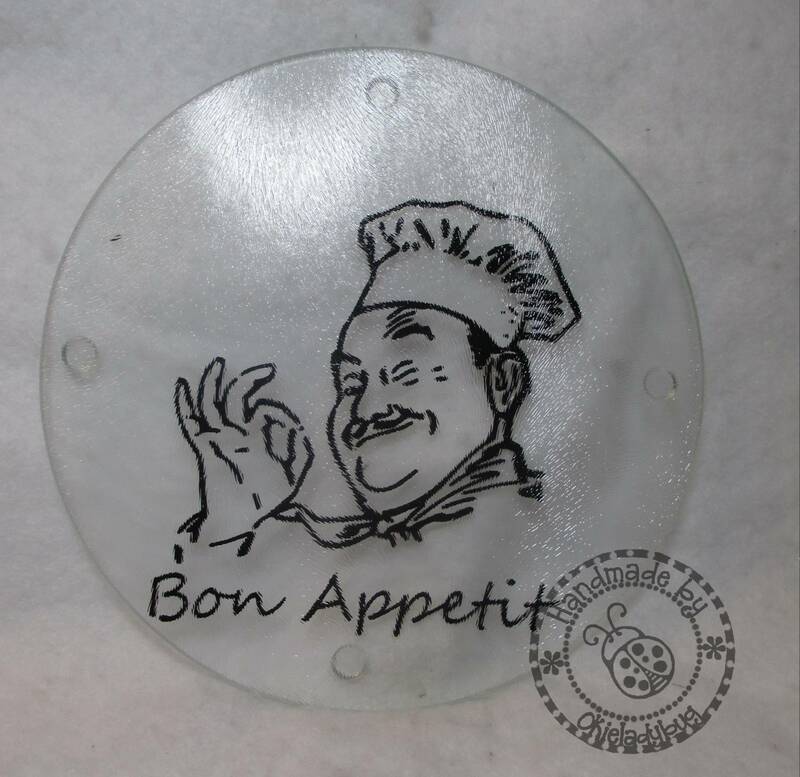 The first cutting board we did was the Chef Boyardee guy with "Bon Appetite". I did a trace and he seemed a little difficult to cut so I did a shadow on him and it helped. Of course it could be that we don't know how to use the Cameo very well. We had a make a call to Linda to get some pointers to even be able to load the dang mat! I do have to say I like my mat guide on my Pazzles a lot better than the mat guide on the Cameo. 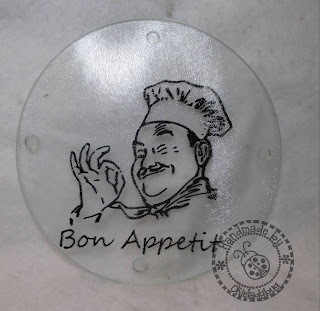 I also learned that the clear transfer tape I use is a lot easier to use for placing things than the transfer paper I got at the vinyl shop last month. 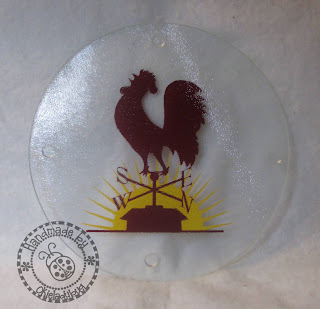 The next design we did was a morning rooster. Even though we had to layer the vinyl backwards this was a lot easier to weed than the chef. We also learned that not all vinyl is created equal! We used some of my vinyl on this one and it worked better than the vinyl that came with my cousins Cameo. We found the rooster on an internet search and then I made the sunrise out of another file I had by tweaking it a bit. This one was our favorite. Our last cutting boards were very simple and my cousin said she wanted a cupcake. She did an internet search and found htis one. I had to laugh because I told her "OMG! I did a file for that one earlier this summer!" This one was a breeze to cut and I think it would have been cute with some colors layered but by the time we got to this one it was getting late and she needed to head home. Now that Teresa and I have figured out how to use the Cameo I think we will have some crafting weekends coming up! They turned out great! I'm sure whoever receives them as gifts will be pleased. BethAnn M.
The cutting boards look great. I like the rooster best also. More great vinyl projects, tfs! I need to practice using vinyl more. Love the Chef Boyardee guy! All 3 are fabulous! Do you like the Cameo? Did you find it easy to use or do you like the Pazzles better? Love them all! Where do you get your clear transfer tape if you don't mind my asking? I got my clear transfer tape from signwarehouse.com, that is where I get most of my vinyl supplies from and have for years. They have fantastic customer service and you can talk to a live person if you need to do so.